It contains 1-2 percentage of volatile oil that gives this product spicy taste and aroma. The powder and splits obtained from this plant seeds have been in usage since ancient times for the presence of natural ingredients. As far as Indian is concerned, this plant is considered as a natural pesticide to be applied in organic farms. The seeds are processed through roasting and transformed into powder form. This by product is applied as a coffee substitute next to tephrosia seeds. In addition to that, the fine particles of this plant have a strong influence in pet food preparation. Mining industry also make use of this product by blending this with guar gum. The gum is actually the purified endosperm of seeds. There are different varieties of this plant yet each variety has its own characteristics. For example, seeds of cassia occidentalis contain naturally forming contaminants in its source material. The gum form is blended with other types of hydrocholloids like those of carrageenan or xanthan to obtain synergistical gel. This gel contains unique properties supporting industrial usage. Significant compound in meat and poultry product preparations. 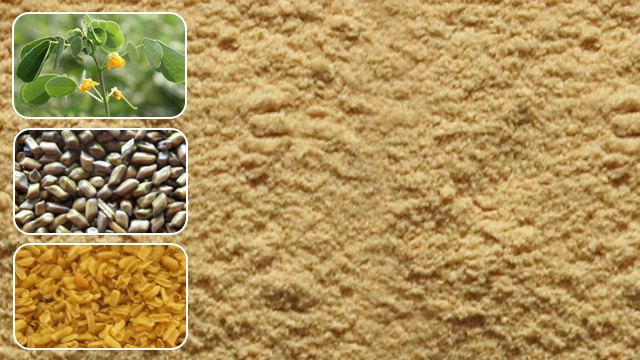 Cassia Gum is one of the popular seeds extracts that is approved for industrial application in Europe and the approval is given by Commission Directive (EEC No.E 499). Safety of this product while using as a thickening agent for human as well as animal pet foods have also been ensured for with the help of A panel of experts from Toxicology and pharmacology and food sciences from United States. The data available on structurally related seed extract products of cassia and other plants shows very less information about presence of toxic effects in animals and human beings. The above review provided by expert panel of US helps to consider cassia gum as recognized for safe usage (GRAS) when it is applied as a thickening agent. The chemical composition of this product shows its rich value of polysaccharides. It is made up of 75% of high molecular weight which is nearly 2000000-3000000 polysaccharide with linear chain of 1.4-β-D-mannopyranose units. It also contains 1,6 linked α-D-galactopyranose uits and the galactose mannose ration is about 5:1. It contains exclusive saccharide composition with 77.2-78.9% of mannose and 15.7-14.7% of galactose and 7.1-6.3% of glucose. It can be applied with the following formula (C6H10O5)n.H2O like that of other types of saccharides. The overall chemical composition reveals this product to be identical like that of carob bean, tara and guar. When combined with carrageenan cassia gum transforms its texture into firm thermoplastic gel. The gel strength of carrageenan increases along with the increase in the level of the gum. This blending is found out to be stable as the gum formed good retorting stability. When applied separately either cassia or xanthan lack the capacity to convert into gel. However, when these two products are mixed in aqueous dispersions, it leads to formation of elastic gels. The effect of gel appears to be more than carrageenan combination due to lower hydrocolloid level in completed formulations and the unique ration of galactose mannose remains a strong reason for this variation. When combined with colloids, this product stays very effective ingredient to be used as gel in different kinds of food applications including food for human beings and animals. The splitting involves series of process and it beings with processing the seeds. While doing so, the outer husk which is also called the endosperm is the actual split. This is also called the ovary or germ of the seed. The split contains majority of polysaccharides that helps in the extraction of gum. The split can be obtained through de-husking and splitting methods in which the husk and germ are separated. The influence of splitting method helps the germ and split to become loosened from the seed endosperm. This is then heated to transform the same into brittle product so that the removal and purification processed can take place easily and the process called pulverization is also applied to speed up the purification. However, the split stays intact even at varying temperatures due to its particle size and the same aspect helps to easily sort out husk and germ particles by adding few more physical cleaning methods. Forms into gel when combined with other seed extracts. Works as thickening component, additive, emulsifier, stabilizer, etc in several industrial applications. It contains higher percentage of galactose side chains which restricts synergistic gelling nature when combined with anionic polymers. Due to this smaller percentage of hydrocolloid blend is enough to obtain the same effect of blending carrageenan of other galactomannans.